Everyone can play guitar, I have never in my 10 years teaching experience come across anyone who can not play. play well it just requires time, some effort, and for most a little bit of on going support and guidance. I tailor each lesson in a fun and easy way for you to build confidence and start playing guitar. A list of typical songs I get students playing only after just a few lessons. These are just a few examples, but feel free to pick any band/solo or song you wish to learn. 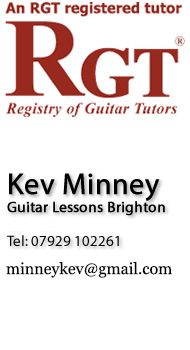 Guitar lessons Brighton welcomes all beginners to learn guitar, the fun and easy way!